Nadan Chicken curry is a Kerala specialty. It could be the rich coconut milk based gravy or the heady spices that makes you hooked to this naadan style of chicken curry. Whatever may be the reason, it is really a great treat for your taste buds. I used to make chicken curry with coconut milk gravy but it never tasted as good as Valiammachi’s (Jibu’s granny) Nadan Chicken curry. It is a real dhamakka; the first time, when I had with her tasty Idiyappam, I got so addicted to this Naadan Chicken Curry, that I had to recreate it. The Nadan Kozhi (Chicken), potatoes, thick gravy everything was finger licking good. The rich brown gravy was filled with flavors and was extremely delicious. I learned it from Mummy (my mil), who and her two sisters has got the same gifted hands as Valiammachi. ‘You can fill someone’s stomach, but you should be able to fill one’s heart as well!’ That is a dialogue from “Ustaad Hotel”, a famous Malayalam movie, which I always connect to these three loving sisters, true to every word. 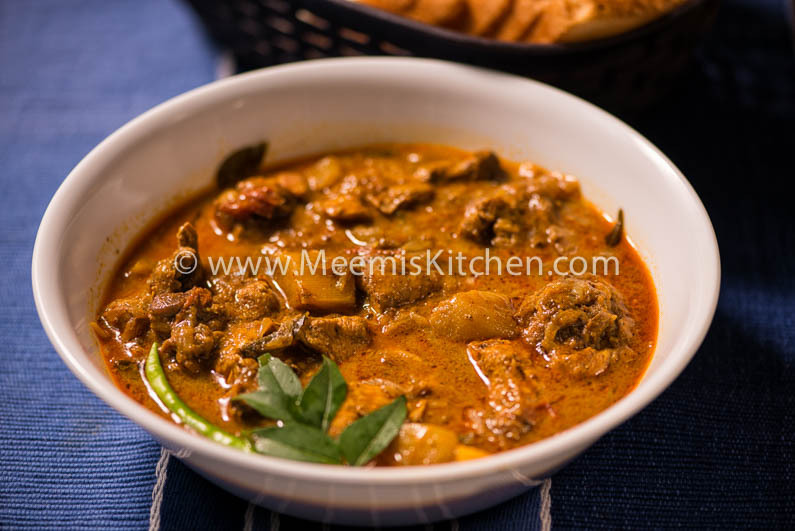 This Nadan Chicken curry is truly special with spicy, thick coconut milk gravy and goes well with Super soft Palappam, Idiyappam, Kallappam, Neer Dosa, Rotis, Rice or Naan. The Potatoes makes this Nadan Chicken curry more delicious. This style is more popular in the Alleppey/ Kuttanadan region. You will just love the flavors and the tasty gravy. 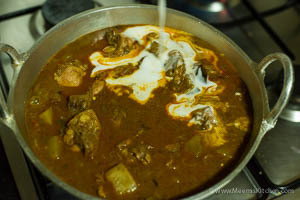 Country chicken is best for this kind of curry, and in Kerala this is very popular. The taste just lingers after your meal. You might also like my other Kurttandan recipes like Kakka Irachi, Tharavu Roast, Beef Fry, Karimeen Mappas, Alleppey Fish curry, Ayala Curry, Chemmeen Roast etc. All over Kerala Nadan style or local style dishes like Duck fry, Pork pepper fry, Chicken Liver curry, Thattukada chicken fry, Biriyani etc are very famous. Without further ado, I invite you to this special Nadan Kerala chicken curry with coconut milk recipe. Clean the chicken pieces. 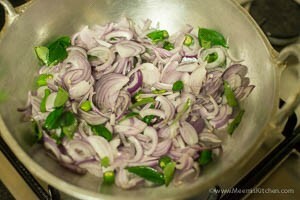 Slice the onions, slit or cut round green chillies, crush the ginger garlic. Heat oil, add the curry leaves, sauté the onion and green chillies till translucent, then add garlic and ginger and sauté for some time. Mix all masala/ spice powders except cardamom powder with some water and make a good paste. Add this to onion mix and sauté for some time, till the oil start separating. 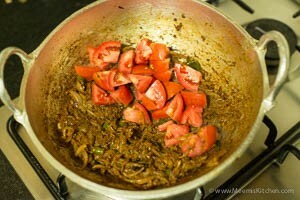 Add the cubed tomatoes and fry for another two minutes. 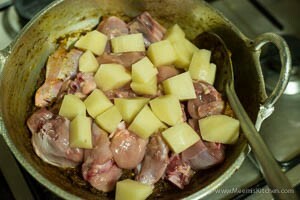 Add the chicken and potatoes and salt and mix well with the gravy. Add the skimmed coconut milk to the gravy and when the gravy starts to boil, reduce the flame and cook covered, stirring in between till the chicken is well done. Lastly, add ½ tsp cardamom powder and thick coconut milk and remove from fire. Serve hot. Naadan chicken curry goes well with Idiyappam, Appam and Kallappam. Also, good with rotis. 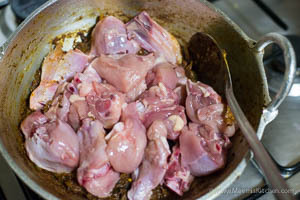 Naadan Kozhi (chicken) is the best for this recipe. Green chilly should be medium spicy. If it is too hot, reduce the no. Perumjeerah taste should dominate the masala, hence adding extra than in the Garam Masala. Cardamom powder should be added last, so the aroma entices everyone. Enjoy and let me know, how it came out. God Bless! !